Researchers at Okayama University report in PeerJ the identification of two candidate genes for eye-misalignment conditions in Japanese patients. Their findings suggest that the two genes are involved in the development of a condition known as comitant strabismus. Flow chart of the linkage analyses carried out by Okayama University researchers to identify the genes associated with comitant strabismus based on the DNA of 204 individuals in 58 Japanese families. Strabismus is the condition of the eyes being misaligned when a person looks at an object. During childhood, strabismus can lead to amblyopia (‘lazy eye’) or depth-perception loss; during adulthood, it can result in diplopia (‘double vision’). If the eye misalignment occurs independently of the direction looked in, the type of strabismus is called comitant. People with a family history of the condition are at a higher risk of having (comitant) strabismus. Recently, depth-perception or stereopsis has been known as important in daily life as evidenced by viewing 3D movies and enjoying virtual reality. Too much near viewing on smartphones or tablet PCs may have overload on eye alignment and may underlie the development of strabismus. Dr. Toshihiko Matsuo from Okayama University has now identified candidate genes responsible for comitant strabismus in Japanese patients. These genes will give a key for understanding how people maintain eye alignment to have depth-perception. To narrow down earlier determined chromosomal loci associated with comitant strabismus to single genes, the scientists used three different linkage-analysis methods — the term linkage refers to the tendency of genes to be inherited together due to their proximity on one and the same chromosome. The transmission disequilibrium test (TDT) and the TDT allowing for errors — essentially, statistical tests on paired data — and a linkage analysis under dominant and recessive inheritance pointed to two genes as potential loci of the SNP for comitant strabismus, abbreviated MGST2 and WNT2. Strabismus (‘crossed eyes’) is the term for the condition when there is a misalignment between the eyes when observing an object — the eyes point in different directions. If such misalignment occurs only for certain directions of observation, the type of strabismus is called incomitant. If it happens for all directions, the condition is called comitant strabismus. Causes for strabismus include muscle dysfunction, farsightedness, brain problems and infections. Cerebral palsy, premature birth, and a family history of strabismus increase the risk of getting the condition. Different types of misalignment occur: esotropia (inward-turning eyes), exotropia (outward-turning eyes) and hypertropia (vertical misalignment). Dr.Toshihiko Matsuo from Okayama University have now identified two potential genes responsible for comitant strabismus in patients of Japanese ethnicity. A single-nucleotide polymorphism (SNP) is a variation of a single nucleotide (a monomer unit of DNA) occurring at a particular position in the genome. The different nucleotide variations for an SNP at a given position are called alleles. 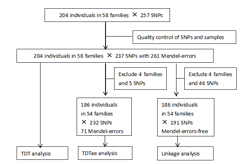 SNPs result in different susceptibilities to diseases, and many human diseases actually result from SNPs. Dr.Toshihiko Matsuo performed SNP analyses to identify single genes responsible for comitant strabismus in Japanese families. Jingjing Zhang and Toshihiko Matsuo. MGST2 and WNT2 are candidate genes for comitant strabismus susceptibility in Japanese patients. PeerJ, 2017, 5, e3935; 2017. Sherin Shaaban, Toshihiko Matsuo, Hirotake Fujiwara, Emi Itoshima, Takashi Furuse, Satoshi Hasebe, Qingrun Zhang, Jurg Ott, Hiroshi Ohtsuki. Chromosomes 4q28.3 and 7q31.2 as new susceptibility loci for comitant strabismus. Investigative Ophthalmology and Visual Science, February 2009, Vol.50, 654-661.